Thinking about remodeling your kitchen next year? It used to be that kitchen remodels returned about 90% of the investment when selling a home, and could definitely help sell a home faster. That made the decision to renovate an easy one: Just do it. 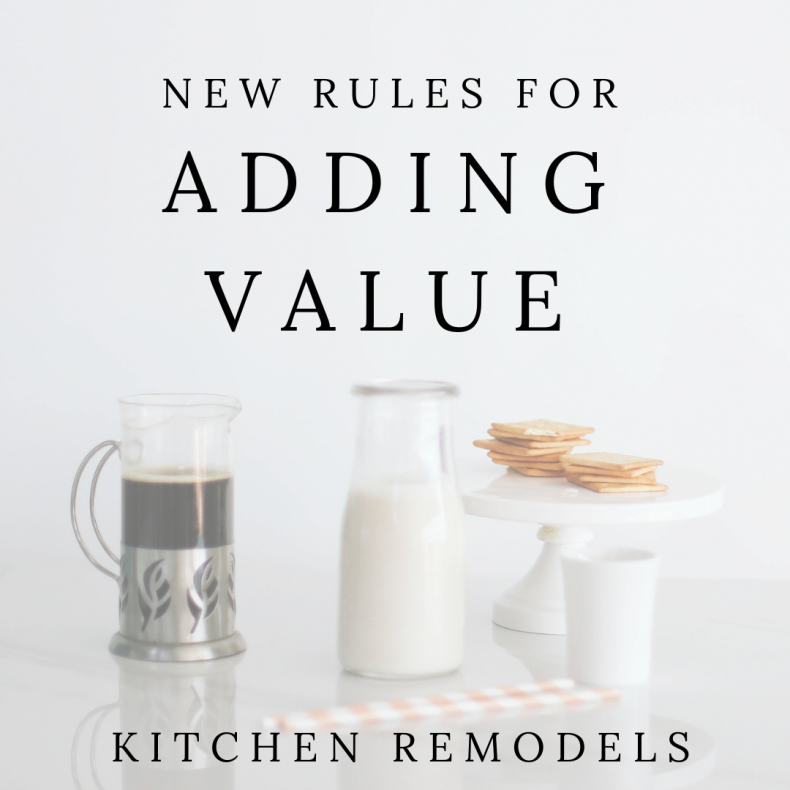 However, due to changing real estate market trends and new tax rules, renovating a kitchen may not have the same financial advantages as it did in the past. A 2018 Cost vs. Value report for the South Atlantic region of the U.S. showed that upscale major kitchen remodels returned 56.0% of the investment and midrange major kitchen remodels returned 60.5%. Why the drop? Real estate professionals tend to agree that we’re approaching a peak in market prices, which means there isn’t much margin for ROI on expensive renovations. Another factor may be that the cost of kitchen renovations has gone up about 20%, making that margin even smaller for the homeowner. The new tax laws restrict home equity line of credit (HELOC) deductions, eliminating the tax advantage of borrowing from your home’s value in order to increase it. Planning to sell next year? Planning on keeping your home for a while? If you’re not planning to sell in the near future, the decision to renovate your kitchen becomes more emotional than financial. If you love your neighbors and your neighborhood, it makes more sense to renovate than to buy a new home. And, a kitchen remodel can have intangible returns that are worth the money, such as an improved sense of well being, and better functionality. If you do decide to remodel, make a realistic budget and stick to it if you want to recoup your investment eventually. That means don’t over-improve your kitchen so that the price of your home outpaces the market in your neighborhood. It’s easy to get starry-eyed over expensive gas ranges, refrigerators that order groceries for you, sparkling granite, and fancy soft-close drawers. That’s okay as long as you understand you won’t recoup much from those luxuries. For the foreseeable future, unless you have money to burn, you’ll be financially (and emotionally) better off if you take the middle road with kitchen renovations. A Home Equity Loan gives you a lump sum all at once. If you’re planning a $60,000 renovation, for example, you’ll use your home for collateral, and you’ll get a check for $60,000. If your reno comes in under budget, you still have to pay back $60,000. That means you’ll have to be disciplined enough to pay back the excess right away instead of taking a fancy vacation with the rest. A HELOC is a revolving line of credit that you borrow against as needed – kind of like a credit card. A HELOC allows you to pay for your renovation in stages and helps you only borrow exactly what you need. Many homeowners finance their kitchen remodels with a HELOC or home equity loan, and with the rise in home values in Charleston, both are popular options. According to new tax laws, you can still deduct the interest paid on a HELOC up to $100,000 as long as you use it for substantial improvements to your home and the combined amount of your first mortgage and your HELOC or home equity loan don’t exceed the value of your home. If you file jointly with someone, you can deduct interest on up to $750,000 of a home equity loan, or $350,000 if you file individually. If a kitchen remodel is on your radar, the decision isn’t as easy as it has been in the past. Since you are only likely to recoup about 50% of your investment, the other 50% of the money you spend has to provide some other tangible return (such as a fast home sale), or an intangible return that justifies the price tag. This article has been prepared for informational purposes only, and is not intended to provide, and should not be relied on for, tax, legal or accounting advice.